Today, Sony Pictures Classics is releasing the small gem Grandma on Blu-ray. Elle Reid (Lily Tomlin) is an aging feminist and misanthropic poet, who is launched into one of the most eventful days of her life when her estranged granddaughter Sage (Julia Garner) shows up, needing to borrow over six hundred dollars for an abortion, sending them both on a journey of old friends and past regrets. For a progressive minded and refreshingly character driven dramedy, that offsets the many laughs with some genuinely moving twinges of bittersweetness, Grandma is surprisingly balanced and quietly remarkable in its approach, carried flawlessly by Lily Tomlin in one of the finest roles of her career. You can read my full review right here. 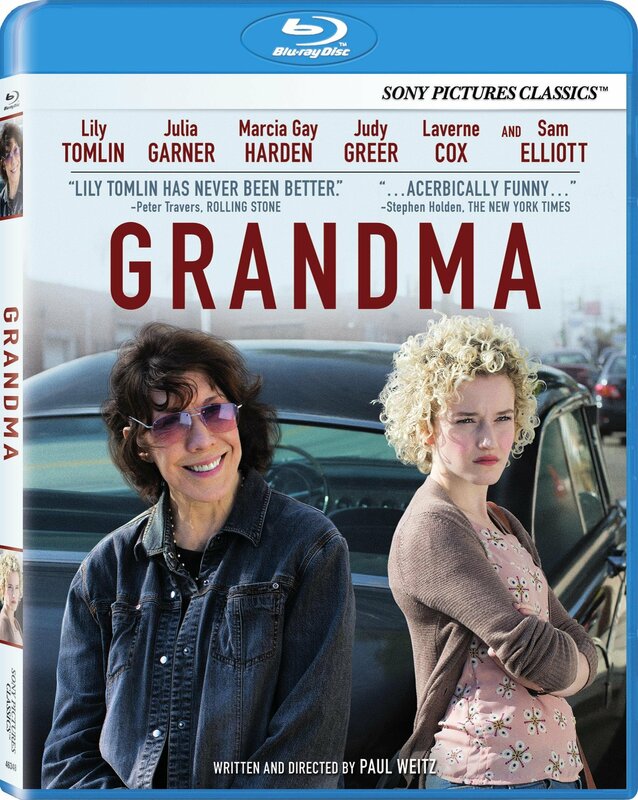 The Blu-ray also includes commentary with director Paul Weitz and stars Lily Tomlin, Julia Garner and Sam Elliot, a Q&A with the director joined by Lily Tomlin and Sam Elliot, as well as a “making of” featurette. Grandma is 78 minutes and rated 14A.